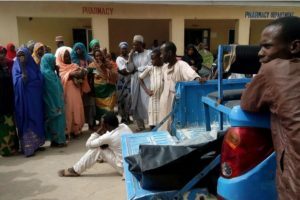 Boko Haram launched overnight coordinated attacks on a military camp and villages around the Nigerian city of Maiduguri, killing at least 18 people and wounding scores, Nigerian officials said Monday. The terror group fighters attacked a military base in the Cashew Plantation area at the entrance to the city with suicide bombers, mortars and guns, leading to a prolonged battle, a senior military officer in Maiduguri was quoted by the Nigerian Vanguard leading Newspapers as saying. The fighters tried to infiltrate the city across a defensive trench, the paper said, adding that 18 Boko Haram terrorists on foot attacked the military base while seven suicide bombers targeted residents of nearby Bale Shuwar and Alikaranti villages. On Friday, four girl suicide bombers, aged between 13 and 18, killed two people in multiple attacks in Zawuya settlement on the outskirts of Maiduguri. This was the first assault since the government announced it was in ceasefire talks with Boko Haram. The attacks by Boko Haram, which has been fighting for nearly nine years to establish a hardline Islamic state in northeast Nigeria, have claimed at least 20,000 lives and displaced more than two million people. Posted by Steven Addamah on April 2, 2018. Filed under News, Zoom. You can follow any responses to this entry through the RSS 2.0. Both comments and pings are currently closed.